1. Shoes: Bring in children or adult shoes in good condition, which we will be donating to Sister House (www.sisterhousechicago.org). We are looking for “gently worn, new or used shoes” only. Score points for the Planet. 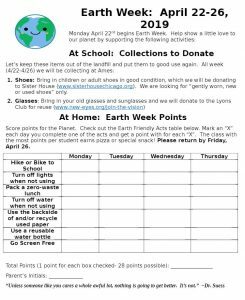 Check out the Earth Friendly Acts on this printable table Earth Week 2019. Mark an “X” each day you complete one of the acts and get a point with for each “X”. The class with the most points per student earns pizza or special snack! Please return by Friday, April 26. 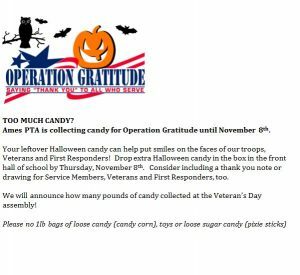 We want you to be our next PTA co-president! We are looking for a creative problem-solver who is comfortable delegating and who can help us focus on the agenda! Our co-presidents play an important role throughout the school year. Not only do you help plan activities, you work directly with the principal, the staff and the District 96 leadership to help make Ames Elementary a top-notch school! 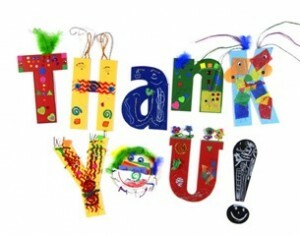 If you are ready to play a substantial role in supporting our school, we want to hear from you! Start working closely with our current PTA Co-presidents to be ready to take the lead in the 2019-2020 school year. For a list of roles and responsibilities click here. The after school Spanish Amigos class being offered by the Riverside Parks and Recreation at Ames Elementary School is currently below the minimum. This class is scheduled to start on Monday, February 4th. In an effort to spread the word and encourage more participation the Riverside Parks and Recreation has extend the deadline for registration to this Friday, February 1st at 10 AM. If they do not reach the minimum they will have to cancel this session. Please see this link for more information 2019 Riverside Parks and Rec WinterSpring Classes. 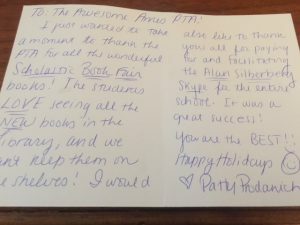 A thank you card from Ames Librarian Patty Prodanich to the Ames PTA. We need your help. The PTA is hosting the annual holiday cookie exchange for our awesome Ames Staff. 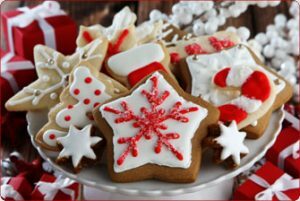 The staff love this event and get so excited to make a box of cookies to bring home to their friends and families. Can we match the amazing display from the Election Day bake sale? Store bought okay, too. 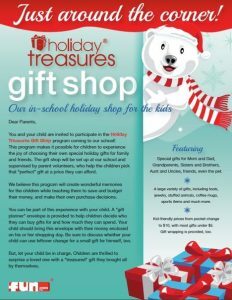 Drop-off – Wednesday, Dec 19 after school or Thursday, Dec 20 before school. Additional instructions closer to event. 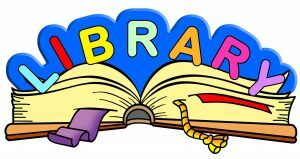 In Junior Great Books, 2nd – 5th grade students read stories and share their ideas and opinions about that they read. The narratives have been selected to spark children’s ideas, and promote discussion while expanding their literary exposure. Groups meet weekly beginning the week of January 7, and end mid-March. The students and adult leader meet during lunch hour and discuss the stories while eating lunch together. The kids love the idea of eating in a classroom and participating in a “book club”. 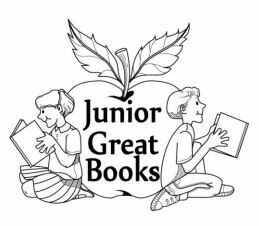 If your child is interested in being a part of Junior Great Books, please fill out this form Junior Great Books Sign Up and return it, along with a $5/child book rental fee, no later than Friday, December 7, 2018. NOTE: This is a voluntary program. Please be sure your child wants to participate, as unwilling participants tend to be disruptive. Late sign-ups cannot be accepted. Ames Holiday Gift Shop is Coming! The Ames Holiday Gift Shop is coming! On Wednesday and Thursday (November 14-15), students can shop for gifts for moms, dads, brothers, sisters, grandparents and special friends. The gifts will be moderately priced, with most under $5. You can view items online by clicking the link below. Don’t want to send cash or check with your child? Purchase a voucher, print and send with your child on their shopping day. A voucher can be purchased in the amount of $10, $15, or $20. A $1 processing fee is added to each voucher purchase. Grandparents can even support your child with a purchase. They simply email the voucher back to you to print. Easy and safe! Students will bring home information this week including a gift list planning envelope. Checks should be made payable to Ames PTA. We strongly encourage purchasing gift vouchers as Ames Elementary and Ames PTA are not responsible for lost or misplaced money.